“Blessed are the poor in spirit: for theirs is the kingdom of heaven.” (Matthew 5:3) Let’s give these words spoken by Jesus life as we jointly share our stories. The picture above could perhaps make one think that you are blessed if you are maybe sad? Look how the heart of the purple character seems to project out of the body with a “sad face”. How could this be “blessed”, one might think? What does it mean to be poor in spirit, as Jesus said we ought to be? I don’t understand this, because it seems to me that we ought to strive to be rich in spirit, not poor. Or am I missing the point? Your confusion is understandable; after all, the Bible does warn us against being empty and impoverished in our souls, and urges us to seek spiritual riches instead. Jesus said, “For where your treasure is, there your heart will be also” (Matthew 6:21). But Jesus also said that there is another kind of spiritual poverty—one we should seek. He said, “Blessed are the poor in spirit, for theirs is the kingdom of heaven” (Matthew 5:3). What did He mean? Simply this: We must be humble in our spirits. If you put the word “humble” in place of the word “poor,” you will understand what He meant. In other words, when we come to God, we must realize our own sin and our spiritual emptiness and poverty. We must not be self-satisfied or proud in our hearts, thinking we don’t really need God. If we are, God cannot bless us. The Bible says, “God opposes the proud but gives grace to the humble” (James 4:6). Now, that I have a glimpse of my total need in communicating this truth at all times, now what? Tammy quotes above, “in other words, when we come to God, we must realize our own sin and our spiritual emptiness and poverty. We must not be self-satisfied or proud in our hearts, thinking we don’t really need God. If we are, God cannot bless us. The Bible says, “God opposes the proud but gives grace to the humble” (James 4:6). A few years ago Tammy and I had a shared “need” and we had many tears, discussions, prayers and lots of Hope. We both had been unfairly treated. We were on a ‘forgiveness journey’. It involved others as well. I really believed the many hours spent in conversations as we studying God’s Word and wanted a Christian solution we got one. For those that are studying from our text book, I’m on page 26, 4 questions. I think we made it through that rugged terrain. Maybe a few scratches and scars. The later vital question outside the 4 Flora speaks of, “what are my choices at this time?” This brings me full ⭕️…Am I “self-satisfied or proud in my heart ♥️? Seems when the needle needs to be threaded over and over on this or like issues I find myself in the making excuses column. Well, my friend Tammy has no trouble remind me I’m wrong. I become painfully aware of my need for God over and over again. “Poor in Sprit” seems to become to me something as simple yet life needful as my food pantry. It runs low and at times pretty empty. I know without a doubt I need and I want and I have a passion for food. Do I feel the same passion about the need for the Holy Spirit to be on dutifully fulfilling His promises in my empty spirit pantry according to John 14:16-17  And I will ask the Father, and he will give you another Counselor to be with you forever —  the Spirit of truth. The world cannot accept him, because it neither sees him nor knows him. But you know him, for he lives with you and will be in you. Sorry Tammy, my mistake page 26….I have corrected in my comment. BTW, my 24 is blank as well. What joy to know we can forgive ourselves and truly know we are forgiven by Our Lord. Truly a lot of heart and head truths on pg 22 to integrate in our inner being. Thanks Tammy. I’m going slow. Like a turtle. 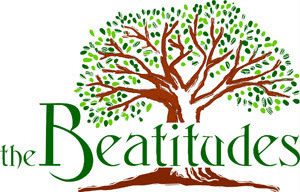 🐢 I have been thinking I have read and heard the Beatitudes many times and mostly saying happy/blessed am I for mine is….then like a 🐇🐇🐇 on I went! Reading along with our writer and pausing to think about the words of Jesus along with Wuellner’s thoughts and stories begin to make traction in my thinking. And, many other issues that in my humble opinion need to have a JesusToo movement applied where the power of Blessed are you takes on action that brings the healing some might be searching for. Oh my oh me! The Holy Spirit sure knows how to organize and work on our behalf’s. I spent last night and early this am trying to figure out to “Heart-mind” myself in our study. And, one of my online devotions seems to be delivered timely from The Holy Spirit. It’s times like this happiness ensues. Tammy brought to our attention in her first comment, “Look how the heart of the purple character seems to project out of the body with a “sad face”. and faith to avoid second guesses. to the life you want me to live. Help me to hope in your promises. If you are with me, who can be against me? as a wonderful gift from you. This is the day and the year that the Lord has made. Your step processing above, Sara, helps me see the ‘point’ more clearly. Two take-always I have focused on from the chapter are “Little can change until we have faced where we actually are” (pg 26); “…we need to stay with that special difficult focus of what actually happened, or we easily slip back into denial.”(pg 28); and …”to be as honest as we can within the enfolding strength of God.” (pg 31). My thoughts: Forgiveness is a journey, a “release from the prison and burden of the past, release from the chains of resentment and guilt that hold us back from entering God’s freedom”(pg 21). Forgiveness is “an ongoing, deepening process”(pg 22). “Forgiveness exists already–we do not create it; we enter it” (pg 22) We can’t do it alone. We need God to help us name our hurts and our needs. (pg 26) Sara said above : “Victory is mine!” I’d like to copy the last sentence from the introduction (pg 14), in Wuellner’s book: “The living Jesus Christ not only empowers us for healthy forgiveness but walks the path with us, enfolding us with God’s compassion, praying through the pain ‘that my joy may be in you, and that your joy may be complete.” (John 15:11) ……………….. Sounds like “Victory” to me! Amen and amen Tammy! I must say it amazes me how this gifted writer so creatively jolted our thinking of what seemed a bit morbid to be blessed for into Victory!